Happy Tuesday! I wanted to share a look that I did for a wedding a few weeks ago. I noticed the purples are becoming a staple bridal look. You can definitely add color while making it more neutral. Take a look! During the trial, I used the Stila in the Moment Palette. There's a light wash of purple in the crease to give a bit of oomph to the look. I made sure to have the bride monitor how her makeup wore after the trial to ensure that I make necessary adjustments on the big day. The bride shared that her scars and oils broke through. I had treated her prepping and priming as if she had normal skin but instead, I treated her as an oily skin type. This made the makeup last! Check out my June Favorites because I used many of the Summer Proof makeup products. I also upped the glamour factor a bit more with more coverage and color. Check out the before and after! Hope you all enjoyed! More bridal looks coming soon! Ren this is so beautiful! I love the purple in the crease (my favorite color). What a transformation!! 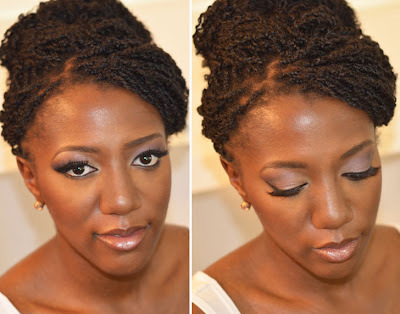 The bride must have floated down the aisle...her makeup is angelic!! Awesome job!! Beautiful I love the makeup you did! This is soo pretty. You're very talented.